When I was first introduced to Twitter several months ago, my initial reaction was "Yawn". After testing the waters for about two weeks, my seconday reaction was an even bigger yawn. Then, just as I was about to put a nail in the Twitter coffin, I discovered Tweet Deck (more on Tweet Deck a little later). I can't take credit for finding Tweet Deck; I'll give those honors to two of our technology leaders: Luther Andal and Courtney Bearse. They forced me to download and install the software, and after two days of using it, I was hooked. I officially became a Twitter geek. The short format of the tweet is a defining characteristic of the service, allowing informal collaboration and quick information sharing that provides relief from rising email and IM fatigue. Twittering is also a less gated method of communication: you can share information with people that you wouldn't normally exchange email or IM messages with, opening up your circle of contacts to an ever-growing community of like-minded people. Your tweets are displayed on your profile page and on the home page of each of your followers. If you cut through all of the technical jargon, Twitter can basically be defined as a platform for easily gathering and disseminating information. In my experience, Twitter can be a viable resource for every publisher, blogger, or online news outlet. It is a great way for news services to get their information out to the people. Individuals who are just using Twitter to post updates on their personal lives will eventually go away. In my opinion, Twitter has no future in that regard. However, more and more people are using Twitter to receive the news and information that interests them, and then sharing that information with the rest of their peers. This the way Twitter is supposed to be used, and it's also the reason you should care about it. 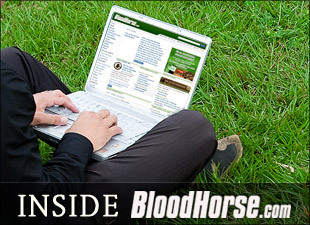 www.twitter.com/BloodHorse - Stay up-to-date on all the latest Thoroughbred news. www.twitter.com/BH_RaceResults - Receive real-time domestic results for maiden, allowance, and stakes races. www.twitter.com/BH_SaleUpdates - Receive real-time sales updates from Online Editor Ron Mitchell and other TBH staff members. www.twitter.com/JasonShandler - Blood-Horse Staff Writer Jason Shandler talks racing. www.twitter.com/lordatwar - The Blood-Horse's Tom Hall keeps you updated on the latest International happenings, including results from major stakes. www.twitter.com/BH_MaidenWatch - The Maiden Watch blog follows the offspring of selected 1st-crop sires. www.twitter.com/BH_AdamsTurf - See the industry from the eyes of Adam Spradling, an industry newbie. If you are following one of the feeds listed above, you can be notified immediately every time a story is posted on BloodHorse.com, a race result is available, or a new sale topper is announced. Twitter allows you to access this content via your desktop, text message, email, or mobile device. Accessing the news and information that you're interested in has never been this convenient. You can choose to follow as many people on Twitter as you would like, which allows you to aggregate all of your news sources into a single platform. Copy and paste each of these urls into your browser window and click "Follow" after each page loads. Step 3: Go to http://www.tweetdeck.com/ or one of the other third party applications mentioned earlier and download their free software. Once the program has installed and launched, it should ask for your Twitter username and password. Enter your information and enjoy the ride. Just give it two weeks. Who knows, you may turn into a Twitter geek yourself.